OMG! thank you so mush for the picture! i always wanted to see the other side. thanks! Ooo! Watanuki & Yuuko look as lovely as ever. Thanks you so much for the scan Marissa-sama! It's amazing. It's absolutely wonderful. Look! It's Yuko-san and Wata-kun~! I love Wata-kun more! the color is so... alluring and scary and all that. I don't watch this anime much, but isn't she the transporter person? I hope you don't hate me for my lame synopsis of who Yuuko is, but I don't know much about her. THANK YOU FOR THE UPLOAD! The colors have this creepy Japanese-horror effect, it's gorgeous! This one is definitley a favourite. It almsot looks as if the lace in the fan is real, not just painted. Love the rose motif. thanks for posting. Thanks for sharing this awesome pic! 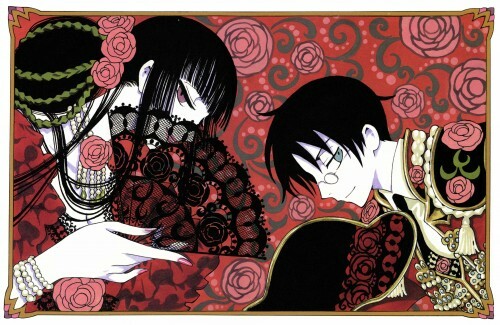 Yuuko and Watanuki looks so evil. lol.. Wataruhi...... I love Yuuko!